Rolling soybean fields immediately after seeding is not new. This practice has taken place in Ontario for many years to manage stones and improve harvestability. But in some years, there’s a rain or some other reason why we can’t roll right after seeding. 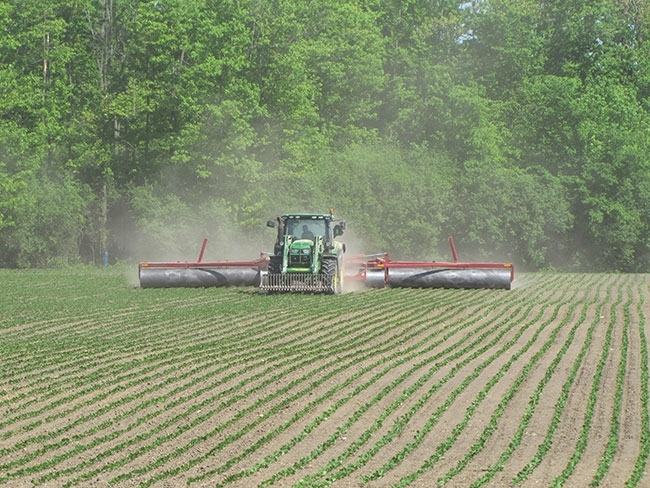 An Ontario project aims to find out if rolling soybean fields after emergence will increase yields. Rolling soybean fields immediately after seeding is not new. Bohner is leading an Ontario project to try to nail down exactly how the timing of land rolling affects soybean yields and when is the best time to roll. Research to evaluate soybean rolling at different crop stages has included studies in such places as Michigan, Illinois, Minnesota, Iowa and North Dakota. Some studies have found that rolling doesn’t provide a yield advantage, but others have shown higher yields with post-emergent rolling. “The obvious reason for a yield benefit from rolling right after planting is that the roller pushes stones into the soil, flattens any uneven, loose soil, and pushes down crop residue, allowing the combine header to do a better job of picking up the lowest hanging pods,” Bohner notes. He adds, “This concept is similar to the idea of spraying a post-emergent herbicide to actually hurt the beans a little to stimulate extra yield, which has been tried by many people over the years.” He explains that soybeans seem to actually perform better if somewhat stressed, but you need to apply just the right amount of stress at just the right growth stage. Otherwise, yields could suffer. 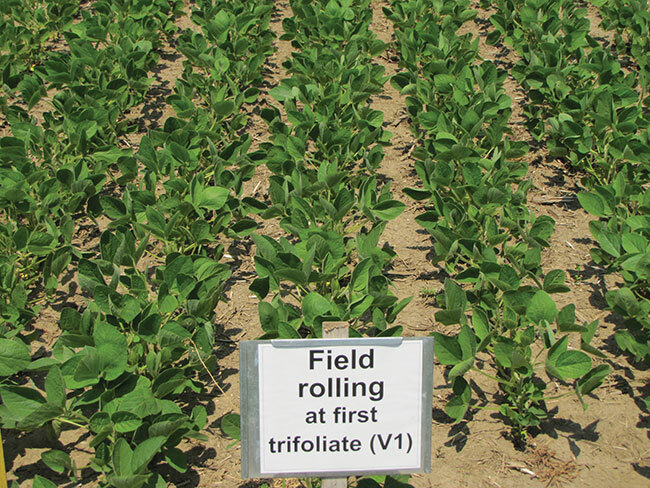 Bohner’s project is comparing five treatments: rolling immediately after seeding; rolling at the V1 growth stage (first trifoliate leaf stage); rolling at V2 (second trifoliate); rolling at V3 (third trifoliate); and an untreated control. He didn’t include rolling between emergence and the unifoliate stage or rolling once flowering starts because rolling at either of these stages tends to permanently damage to the crop. His project team is using a 30-inch diameter, smooth roller. They roll the trials on warm afternoons so the plants will be limp and recover quickly from rolling. In 2017, the project’s first year, they conducted four trials, with sites near Bornholm, Lucan and Winchester. Two trials were on no-till fields, and two were on conventionally tilled fields. Since crop residue can cushion the plants when they are rolled, Bohner wanted to find out if soybeans in the tilled fields would have greater plant damage and perhaps poorer yields. The 2017 results showed a small yield advantage from rolling at V1 (see table), although the statistical confidence in this yield gain is not very strong. None of the other treatments were statistically different from the untreated control. Rolling didn’t seriously impact the plant stands until V3. At V3, the stems broke off more easily, killing the plants and decreasing yields. The yield results were fairly consistent between the four sites. Although the rolled plants at the tilled sites had more damage than those at the no-till sites, that greater damage didn’t translate into poorer yields. “The good news from 2017 is that, if you do the rolling right, which means you use a smooth roller (not a packer or other more aggressive form of rolling), you run that on soybeans in the early vegetative stages, V1 maybe up to V2, and the beans are not extremely stressed, then there is no problem with rolling beans once they come up. They stand up very quickly again and yields don’t suffer,” he says. “Now, to answer the question of whether post-emergent rolling actually improves yields, we need more data. That’s the idea behind repeating the trials in 2018.” According to Bohner, it is highly unlikely that post-emergent rolling will increase yields by more than one or two bushels per acre. This year’s trials are taking place at six Ontario sites, including both no-till and conventionally tilled fields, and involve the same treatments as in 2017. Both in 2017 and 2018, Bohner noticed that, at sites where growing conditions turned colder after planting, soybeans rolled right after planting tended to have a harder time emerging. The firmer soil after rolling made emergence a little tougher for the struggling plants. After harvest, he’ll be able to tell if this problem influenced yields. Depending on how the 2018 trials go, Bohner will likely repeat the trials in 2019. Grain Farmers of Ontario have provided some funding for the trials, and Dupont Pioneer, Syngenta and DeKalb have provided seed. An Ontario project aims to find out if rolling soybean fields after emergence will increase yields. “At present, my perspective on rolling is that, because of the improvement in header pickup, there’s a small but real benefit from rolling for many soybean growers,” Bohner says. “Whether to roll them right after seeding or to wait until after they come up will depend on a number of factors including soil type, how many acres you are planting, the weather, and other practical issues. So that will become more nuanced with respect to a specific grower. If you’re new to post-emergent soybean rolling, Bohner offers some tips. He recommends using a smooth roller, not a packer, for post-emergent rolling. “The amount of pressure per square inch with these land rollers is relatively low. It is pretty gentle on the land.” The tractor tires will cause more plant damage than the roller. Try to avoid overlaps when rolling because double-rolled plants are often too severely damaged to recover. “If you are nervous about rolling beans after emergence, I suggest that you roll once down the field and then get off the tractor and find something else to do for three or four hours. Then come back and compare the rolled beans to ones that you haven’t rolled,” Bohner says. “If things are the way they should be, those beans will have stood up again and you will only have cracked off a relatively small percentage of the plants, maybe one in 20 plants. Then you’ll have some comfort that the beans will be just fine, and you can roll the rest of the field.